Jaspilite banded iron formation. Photo by James St. John, Flickr. Researchers from the Department of Biology and Geoscience at the University of Akron, in the United States, say that communities of microorganisms play a role in the formation of unique iron ore caves, which make up only about one per cent of caves worldwide. 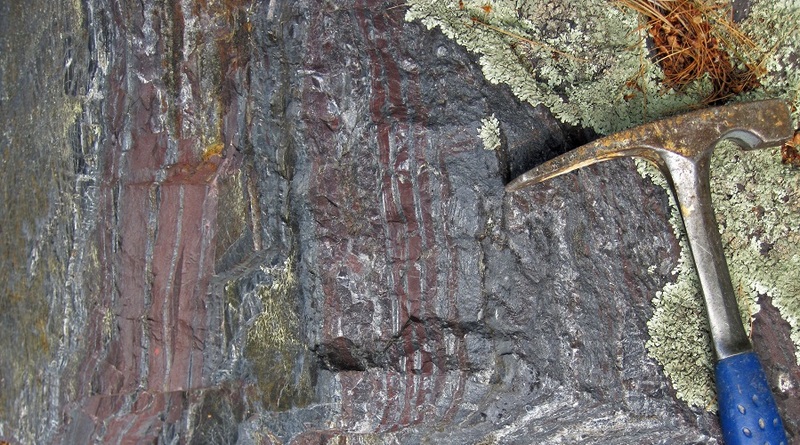 According to the scientists, banded iron formations, or BIF, have high populations of active microbial communities. These formations, which they have been studying for seven years in Brazil, are extremely resistant rocks formed from iron deposits in ancient oceans. Their surfaces can be more than a billion years old. Microbes living there use iron within the rock to respire, in a similar way that humans use oxygen. This respiration causes the rust-like iron oxides that make up the cave to become soluble, the researchers explain in a press release. Their theory is supported by the discovery of dissolved iron in water within the cave, as well as by evidence that the iron is dissolving behind the walls, causing the cave to collapse in on itself. “The team now believes the flow of groundwater simply carries off the iron oxides after microbes do all the work of chewing through the BIF. Over time, this process could be responsible for the voids in the walls of the cave, which eventually meet to form a new cave that is large enough to be entered by humans,” the release reads. Asked about the importance of these findings, the director of the university’s integrated bioscience program, Hazel Barton, said that there is a strong correlation between the location of these BIF caves and the presence of iron ores of global economic significance. Barton and her group recently received new funding to continue to test their hypothesis both in the field and in a lab. Their plan is to use models to show how iron is oxidized and swept away. The data gathered will show potential cave-forming processes across a range of scales, from microscopic to regional. Iron ore is a key ingredient in the production of steel.